Likes: I love treats and toys and I'll work hard for them! I can get a bit overexcited about other dogs so you'll need to help me socialise. Dislikes: I'm not fond of cats and can't live with them. Needs: I need some further reward-based training so it would help if your children are over 16 so that they can help me settle in. I need to be with people who will be patient and allow me to settle in as well as giving me boundaries and training to keep me calm and happy. 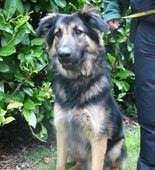 Contact: Call Dogs Trust Evesham on 01386 830613 or visit the Dogs Trust website.